In addition to workshops and conferences associated with specific projects run by the Centre, we also organize regular public seminars, reading groups and conferences. A central objective of all such events is to foster interdisciplinary collaboration between researchers working on issues in cognitive studies. If you would like to be added to our email list for announcements of future events please email Bernardo Pino Rojas. The Conscious Mind and the Computational Brain: Where's the Gap? 3-5pm, Venue: Jessop Building (Music), JB-215. All are welcome! Joseph Levine (2008) Secondary Qualities: Where Consciousness and Intentionality Meet. The Monist, 91.2, 215-36. Joseph Levine (2010) Phenomenal Experience: A Cartesian Theater Revival Philosophical Topics, 20. Joseph Levine (2014) Modality, Semantics, and Consciousness. Philosophical Studies, 167.3, 775-784. 3-5pm, Venue: Arts Tower, AT-LT08. All are welcome! Human nature isn’t just what’s identical across all individuals and cultures. Humans vary in personality, language, culture, and many other traits that are, nevertheless, the result of the evolutionary process. These often, therefore, take the form of local variations on universal themes. At least some of this variation may be the result of evolved developmental systems that project developmental experience into phenotypes, creating universality along some dimensions and variation along others. If so, how do we develop theories of these evolved mapping functions, and test between different hypotheses about their design? In this talk I present a series of experimental studies of cognition across cultures, and ask how we can begin to understand the variability and universality that these studies reveal within a common evolutionary, developmental, and cultural framework. 12-2pm, Venue: Hicks Building,HI-LT09. All are welcome! In philosophy, morally responsible agency is often understood as reflective activity – concerted, self-conscious mentation, predicated on accurate self-awareness. In psychology, quantities of research on automatic processing problematize this understanding: much morally significant behavior is not consciously regulated, and much of it is informed by inaccurate self-awareness. A psychologically lifelike conception of agency will therefore de-emphasize reflection; instead, the exercise of agency will be found in the collaborative social dialog by which human beings structure their lives together. 3-5pm, Venue: Jessop Building,JB-SR 116. All are welcome! Do professional ethicists behave any morally better than do non-ethicists of similar social background? If not, do they at least show greater consistency between their normative attitudes and their outward behavior? Despite a long philosophical tradition associating philosophical reflection with improved moral behavior, these questions have never been empirically examined. I present convergent evidence from studies of about a dozen different types of moral behavior. The results suggest that ethicists behave no morally better on average or any more consistently with their espoused values. Using a combination of direct observation and self-report measures, I examine: the misappropriation of library books, voting in public elections, courtesy at professional meetings, responsiveness to student emails, charitable donation, organ and blood donation, staying in touch with one's mother, vegetarianism, honesty in responses to surveys, nonpayment of conference registration fees, Nazi party membership in the 1930s, and peer evaluation of overall moral behavior. 2-4pm, Venue: Arts Tower, AT-104. All are welcome! In this paper I propose an account of the intentional structure of communication that corresponds closely to the one first described by Paul Grice. Many have objected that Gricean communicative intentions could be entertained by neither young children nor great apes. However, I argue that the cognition required for the production and comprehension of these communicative intentions is less demanding than traditional interpretations of Grice have implicated - requiring neither a concept of belief, nor of the ability to entertain high-order meta-representations. Rather, in communication speakers exploit lower-level embodied processes - in the form of ostensive cues - that, when combined with words or gestures, are sufficient to enact communicative intent. I argue that interlocutors are also sensitive to speakers' performance of these cues, and that they consequently facilitate their interpretation of speakers' utterances. However, I argue for a weaker interpretation of the function of ostensive cues than has been advocated in recent years by Gyorgy Gergely and Gergely Csibra; and support this interpretation with new empirical data. Once the intentional structure of communication is understood in terms of the actions by which these intentions are enacted, it becomes plausible to think that not only the communicative acts of young children but perhaps also the gestures of great apes have something like a Gricean intentional structure. 2-4pm, Venue: Hicks Building, HI-LTB. All are welcome! This paper exploits commonly held theories of metaphor and irony so as to evaluate ‘embedding’ as a criterion for distinguishing an utterance’s truth-conditional content from its implicatures (§1). I argue that the embedding criterion classifies both the metaphorical content and the ironical content as truth-conditional (at least in some cases), but that it does so correctly only in the case of metaphorical content (§2). Its classification of ironical content as truth-conditional is incorrect (§3). 2-4pm, Venue: Firth Court, Tapestry Room. All are welcome! Robin Scaife (Sheffield), James Andow (Nottingham), and Bryony Pierce (Bristol) have set up a new experimental philosophy group, with the support of Stephen Stich, Professor of Philosophy, Rutgers and Honorary Professor of Philosophy, Sheffield. Experimental Philosophy Group UK will provide a forum for UK-based researchers from all disciplines who use experimental methods to investigate philosophical topics or have a research interest in this important, burgeoning field. Empirical evidence is relevant in many philosophical debates and experimental philosophy provides the resources for researchers to gather that evidence, enabling researchers to design experiments that address specific questions of philosophical significance. Anyone interested in joining the group should contact experimentalphilosophyuk@gmail.com or join the Facebook group. The only criteria for membership are involvement in UK-based research and an interest in experimental philosophy. News and information about the group will be posted on Facebook and the new website at http://sites.google.com/site/experimentalphilosophygroupuk. Seminars will be held in the Humanities Research Institute seminar room (click here for directions) unless otherwise noted. Everyone is welcome! This seminar will be held in the Arts Tower, LT8, 2.30-4.30pm. This seminar will be held in the Humanities Research Institute seminar room (click here for directions), 1.30-3.30pm. The question of whether similarities among assemblages are due to common descent or arose independently is a key problem in both biological and cultural evolution. In this talk I discuss how methods that were originally developed in the former field are being applied to the latter, focusing in particular on traditional crafts and folktales. Phylogenetic analyses of these traditions demonstrate that, despite the rapid pace of cultural change and the effects of borrowing and blending among societies, it is possible to reconstruct historically deep, coherent lineages of cultural descent. These lineages provide a means of identifying instances of convergence between historically unrelated assemblages, opening new avenues for exploring the relationships between mind, culture and environment. Professor Stephen Stich (Philosophy, Rutgers University), Leverhulme Visiting Professor of Philosophy at the University of Sheffield from March to May 2009, gave a series of four public Leverhulme Lectures in May 2009 on Moral Psychology. All lectures held in the Douglas Knoop Centre at the Humanities Research Institute (click here for directions) from 5.30-7.15pm, followed by an informal drinks reception. Everyone is welcome! 'She is, oh, fiftyfive, sixtyfive years? ': Usage of approximating expressions. An approximating pair is a pair of numbers (a,b) used in a single phrase (”two, three years ago”). Only certain combinations of numbers seem to be used in such phrases - it is tempting to talk about a "grammar" of approximating pairs. It has been debated what this grammar looks like and why (social convention, or determination by some underlying factors, or even an innate grammar a la Chomsky). I will talk about an ongoing project, joint with David Geary and coworkers, where we shed light on these issues through a first study of what approximating pairs people (Swedes and Americans) actually accept. I will also briefly describe our Centre for the Study of Cultural Evolution at Stockholm University. Researchers in cognitive science have increasingly begun to focus on questions surrounding the capacity to represent artifact kinds (see Lawrence & Margolis, in press). Of specific interest to researchers in cognitive development have been the dual questions of what information is at the core of early artifact representations, and to what extent this information changes over development. Some researchers argue that adults and even young children represent information about an object’s ‘designed function’ (e.g. the use intended by the designer) as central to artifact representations (e.g. Diesendruck, Markson & Bloom, 2003; Kemler Nelson, Herron & Morris, 2002). Others have stressed the importance of shared conventional use (Siegal & Callanan, 2005, April); and non-accidental use (Matan & Carey, 2001). An issue that is often obscured within this debate has been the possible differences between the information that is important for categorising artifacts versus that important to determining the function of artifacts. The current paper provides evidence for a dissociation between these questions (see also German & Johnson, 2002; Jaswal, 2005), while extending the range of kinds of information to include information about shared conventional use (as well as idiosyncratic use by one owner). This paper examines the question of what we should take as markers of consciousness. Although my primary aim is to chart the conceptual space surrounding the question of what we should take as makers of consciousness, I do evaluate some proposed markers of consciousness. Owen et al. (2006). Detecting awareness in the vegetative state. Science, 313: 1402. Block, N. (2002). The Harder Problem of Consciousness. The Journal of Philosophy, XCIX, 8, 391-425. This seminar will be held in the Humanities Research Institute seminar room from 3–5 pm, Friday 18 May 2007. The seminar is open to all. (Click here for directions). Is it a conceptual truth about knowledge that knowledge is factive? This seminar will be held in the Humanities Research Institute seminar room from 3–5 pm, Thursday, 26 April 2007. The seminar is open to all. (Click here for directions). Is understanding gaze a developmental precursor to understanding belief? This seminar will be held in the Arts Tower Board Room, on the first floor of the Arts Tower, from 3–5 pm, Thursday, 8 March 2007. The seminar is open to all. Doherty, M.J. (2006). The development of mentalistic gaze understanding. Infant and Child Development, 15, 179-186. This seminar will be held in the Humanities Research Institute seminar room from 3–5 pm, Wednesday, 10 January 2007. The seminar is open to all. (Click here for directions). Lee, J. & Naigles, L. R. (2005). Input to Verb Learning in Mandarin Chinese: A Role for Syntactic Bootstrapping. Developmental Psychology, 41, 529-540. Naigles, L. R., & Lehrer, N. (2002). Language-general and language-specific influences on children’s acquisition of argument structure: a comparison of French and English. Journal of Child Language, 29, 545-566. We will be meeting on Mondays 10am in the Philosophy Department, room in the Attic, to discuss scientific eliminativism from a broad perspective and the notion of natural kind in different domains. Please contact Bernardo Pino for more details. This group will be meeting at the Humanities Research Institute (HRI) every Tuesday, starting on March 11. We will discuss issues in the current debate about the nature and role of modal and amodal representations probably involved in reflective thinking. To join the reading group please contact Bernardo Pino or Francesco Antilici. The Cognitive Science reading group is an occasion to read and discuss articles related to current issues in the interdisciplinary study of cognition. It will meet every Tuesday at 5pm in Jessop West, Hub Room 3 (on the third floor). To join the reading group please contact Philipp Rau. This reading group will be discussing philosophical issues concerning the nature of mental illness. We will start reading Rachel Cooper's "Psychiatry and Philosophy of Science" to then continue with other readings according to the interests of the reading group. Meetings will be held on Thursdays at 4pm in the Philosophy Department, room B23. This reading group will be discussing recent work in philosophy and the cognitive sciences on evolutionary approaches to understanding the mind, examing the diverstiy of such approaches and their critics. Further details to be posted shortly. This reading group is linked to the Department's AHRC Culture and the Mind Project. We will be discussing recent work in philosophy, psychology and anthropology on the cognitive structures underlying our interactions with artefacts and material culture. It will meet every other week alternating with the Philosophy of Psychology reading group. Click here for more details. This reading group will look at some classic and recent debates about issues in the Philosophy of Psychology. It will meet every other week alternating with the Artefacts reading group. Click here for more details. The Folk Psychology and Folk Epistemology Reading Group will be continuing this semester, running alongside the Folk Psychology and Folk Epistemology component of the Centre's Culture and the Mind Project. We will be meeting fornightly to discuss work in philosophy, psychology and anthropology on folk psychology and folk epistemology. Click here for more details. The Norms and Moral Psychology Reading Group will be continuing this semester, running alongside the Norms and Moral Psychology component of the Centre's Culture and the Mind Project. This group will meet fortnightly, alternating with the Folk Psychology and Folk Epistemology Reading Group. Click here for more details. The Folk Psychology and Folk Epistemology Reading Group will be continuing this year, running alongside the Folk Psychology and Folk Epistemology component of the Centre's Culture and the Mind Project. We will be meeting fornightly to discuss work in philosophy, psychology and anthropology on folk psychology and folk epistemology. This year we be starting a new reading group that will focus on the second phase of the Culture and the Mind Project, which is concerned with Norms and Moral Psychology. This group will meet fortnightly, alternating with the Folk Psychology and Folk Epistemology Reading Group. Picking up where we left off last semester, we will continue to meet weekly to discuss work in philosophy, anthropology, psychology on folk psychology and folk epistemology. To join the reading group, please contact Stephen Laurence. This reading group will meet weekly to discuss work in philosophy, anthropology, psychology on folk psychology and folk epistemology. To join the reading group, please contact Stephen Laurence. This reading group will meet weekly to discuss work in philosophy and psychology on moral psychology. To join the reading group, please contact Robin Scaife. This public conference was the final event associated with the third phase of the AHRC Culture and the Mind project, which has been exploring cross-cultural universals and cross-cultural variability in the domains of artifacts and material culture. This meeting was the fourth of a series of meetings for core participants in the AHRC Culture and the Mind Project to follow up from anthropological fieldwork on Norms and Moral Psychology. This meeting was the third of a series of meetings for core participants in the AHRC Culture and the Mind Project to follow up from anthropological fieldwork on Norms and Moral Psychology. This meeting was the fourth of a series of meetings for core participants in the AHRC Culture and the Mind Projectfollow up from anthropological fieldwork on Folk Psychology and Folk Epistemology. 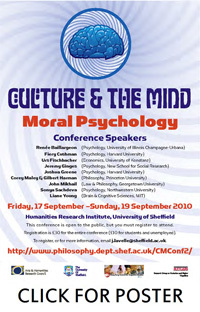 This public conference was the final event associated with the second phase of the AHRC Culture and the Mind project, which has been exploring cross-cultural universals and cross-cultural variability in the domains of norms and moral psychology. This meeting was the third of a series of meetings for core participants in the AHRC Culture and the Mind Projectfollow up from anthropological fieldwork on Folk Psychology and Folk Epistemology. This meeting was the second of a series of meetings for core participants in the AHRC Culture and the Mind Project to follow up from anthropological fieldwork on Norms and Moral Psychology. This meeting was the third of a series of meetings for core participants in the AHRC Culture and the Mind Project to follow up from workshops from the previous year and prepare for anthropological fieldwork. This meeting was the first of a series of meetings for core participants in the AHRC Culture and the Mind Project to follow up from anthropological fieldwork on Norms and Moral Psychology. This meeting was the second of a series of meetings for core participants in the AHRC Culture and the Mind Project to follow up from workshops from the previous year and prepare for anthropological fieldwork. This meeting was the first of a series of meetings for core participants in the AHRC Culture and the Mind Project to follow up from workshops from the previous year and prepare for anthropological fieldwork. This workshop was the third of a series of three preparatory closed workshops associated with the AHRC Culture and the Mind Project. This meeting was the second of a series of meetings for core participants in the AHRC Culture and the Mind Project to follow up from anthropological fieldwork on Folk Psychology and Folk Epistemology. This workshop was the second of a series of three preparatory closed workshops associated with the AHRC Culture and the Mind Project. This meeting was the first of a series of meetings for core participants in the AHRC Culture and the Mind Project to follow up from anthropological fieldwork from the previous year. This workshop was the first of a series of three preparatory closed workshops associated with the AHRC Culture and the Mind Project.